The Lubin UCSB laser propulsion system efforts have been funded by Breakthrough Starshot for $100 million. They are working working to demonstrate proof of concept for light-propelled nanocrafts. A large scale network of several 70 Gigawatt lasers on Earth, Earth Orbits, the moon Mars and asteroids is not as distant as one might think because of several converging systems and technological shortcuts. A laser power of 70GW (without photon recycling) can send a 100 kg craft can be propelled to 1AU in approximately 3 days achieving a speed of 0.4% the speed of light, and a 10,000 kg craft in approximately 30 days. 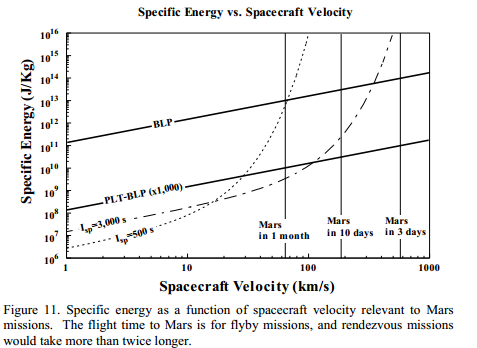 The full scale DE-STAR 4 (50-70 GW) will propel a wafer scale spacecraft with a 1 meter laser sail to about 26% the speed of light in about 10 minutes (20 kgo accel), reach Mars (1 AU) in 30 minutes, pass Voyager I in less than 3 days, pass 1,000 AU in 12 days and reach Alpha Centauri in about 20 years. The same directed energy driver (DE-STAR 4) can also propel a 100 kg payload to about 2% c and a 10,000 kg payload to more than 1,000 km/s. While such missions would be truly remarkable, the system is scalable to any level of power and array size where the tradeoff is between the desired mass and speed of the spacecraft. The NASA funded Directed Energy Propulsion for Interstellar exploratioN in 2015 and 2016 tested a photon recycler. Photon recycling works better for laser pushing larger objects because they have slower acceleration and stay within range of the reflections for a longer time. Photon recycling could reduce the size of the laser array and power systems needed to achieve the desired performance or to increase the performance for the same sized system. 20X size reduction to about 3.5 GW for the laser array and power systems seems doable. 10 GW PLT with a thrust multiplication factor of 1,000, would generate a thrust of 66.7 kN, which can accelerate 6.8 ton Spacetrain at 1.0 g, a comfortable cruising acceleration. Lasers are approaching 1 kw per kg, solar weight to performance (also approaching 1 kw per kg) is also improving and solid state batteries with initially 500 watts per kg could reach 1000 watts per kg. Large scale 3D printing and robotics are being developed for assembly and manufacturing on the moon and in space. All of Spacex resources will go to develop the 150 ton reusable payload capacity BFR rocket. Let us assume one 150 payload for 50 tons of lasers, 50 tons of solar and 50 tons of batteries and another 150 tons for robotics, 3D manufacturing and other astronauts and other systems. 50 tons of lasers at 1 kilowatt per kilogram would be 50 Megawatt and the same for the solar and batteries. 20 such payloads would be 1 gigawatt. 70 would be 3.5 gigawatts. 3.5 gigawatts with a photonic reflection amplification of 20 times would be 70 gigawatt system performance. Spacex is targeting $5-10 million per BFR launch. The launching of each system would be about $1 billion total if Spacex achieves those costs. One Spacex BFR launch per week could put such a system with the assembly robotics and other systems up into orbit within 2 years. Another dedicated Spacex BFR could place a system on the moon within 2 years. Three or four dedicated Spacex BFRs could put the receiving system on Mars within 2 years of launches and effort. The lasers would then be sending and receiving 100 kg packages and satellites within hours transit to the moon. The lasers would then be sending and receiving 100 kg packages and satellites with three day transit to Mars. Manned crew capsules could be going to Mars in 2 weeks and maybe 1 week. The size of the crew capsules should be less than 100 tons. 5 to 10 tons might be the optimal size. 1 week travel times might be stressful for regular passenger trips. The robotic systems would be used to mine the moon, Mars and asteroids to build out massive solar arrays and laser arrays. The best use of the Spacex BFR and the $60 billion per year the US already spends on NASA and military space systems would be to build the interplanetary laser transportation network. Building out to Terawatts of power with larger mirrors would enable even larger and heavier spaceships to be transported. Professor Bae had laid out steps to Photon Propulsion for interplanetary and interstellar Flight. The systems described here are an improvements by several orders of magnitude over regular power beaming. Recycling photons between mirrors reduces the energy requirements as does lightening the spacecraft and shortening the wavelength of the laser. The operation distance of PLT is projected to be up to 1,000,000 km, which can cover a wide range of spacecraft maneuvering over lunar-scale distances. The diffraction limited size of the beaming lens should be on the order of 200 m and the spacecraft mirror diameter 50 m. The sizes the lens and mirror will decrease proportionally as the laser wavelength decreases. 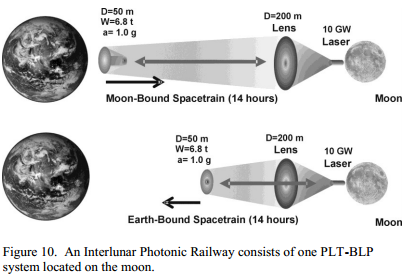 For example, a 100 time reduction in the laser wavelength will result in the lens diameter 20 m and the mirror diameter 5 m.
The Interlunar Photonic Railway with PLTs is predicted to meet the needs of the future generation of space industry market by enabling a wide range of innovative space applications involving the moon as a second step towards interstellar manned roundtrip commutes. For example, a 10 GW PLT with a thrust multiplication factor of 1,000, will generate a thrust of 66.7 kN, which can accelerate 6.8 ton Spacetrain at 1.0 g, a comfortable cruising acceleration.